Recent inductee Shari Fieser was selected by the national Phi Kappa Phil office to receive at 2018 Love of Learning Award. 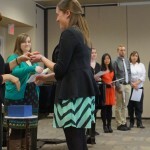 Love of Learning Awards help fund post-baccalaureate professional development for active Phi Kappa Phi members. Awards can go towards graduate or professional studies, doctoral dissertations, continuing education, career development, travel related to teaching/research/learning, and more. 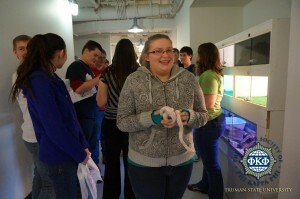 Shari is an Admission Counselor here at Truman and completing graduate studies in leadership. Two hundred awards, at $500 each, are distributed each year. Thank you, Shari, for applying and helping to represent the Truman chapter of Phi Kappa Phi! 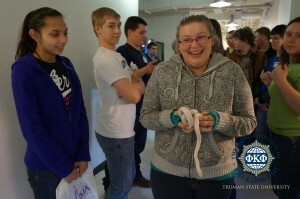 Look who made this week’s Truman Index! 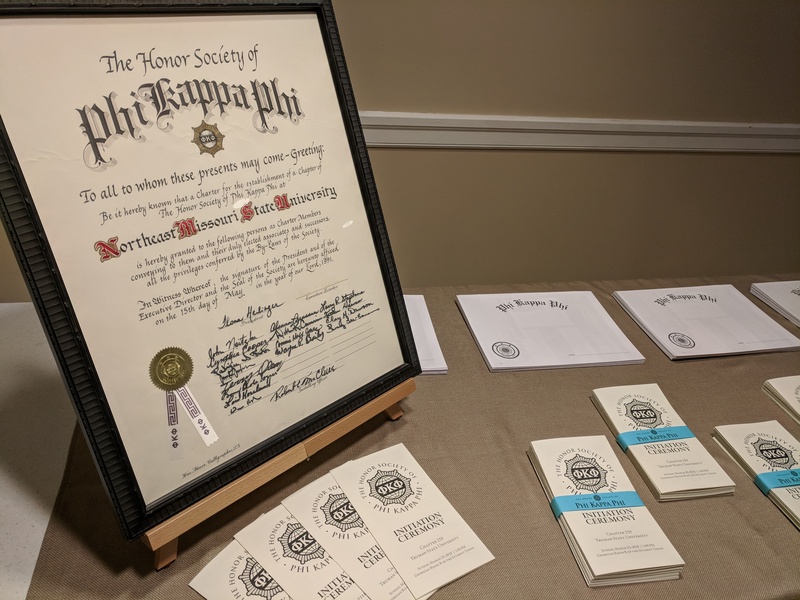 On Sunday, March 25, the Honor Society of Phi Kappa Phi initiated 86 new students, faculty, and staff into the organization. 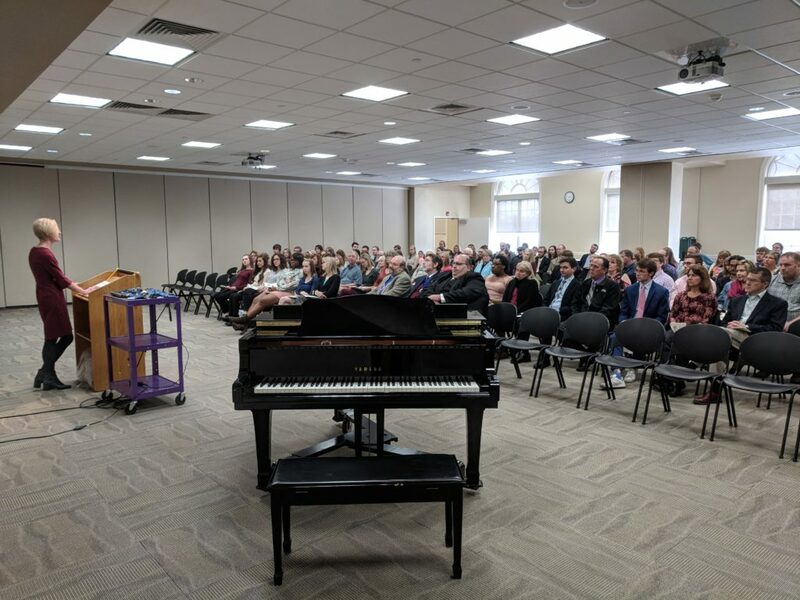 The ceremony included a musical performance by Kaylee Hershberger and a keynote address from Truman’s Provost and Executive Vice President for Academic Affairs Janet Gooch. The ceremony was led by the Society’s president, Dr. Jack Holcomb, and past president, Dr. Michael Ashcraft. 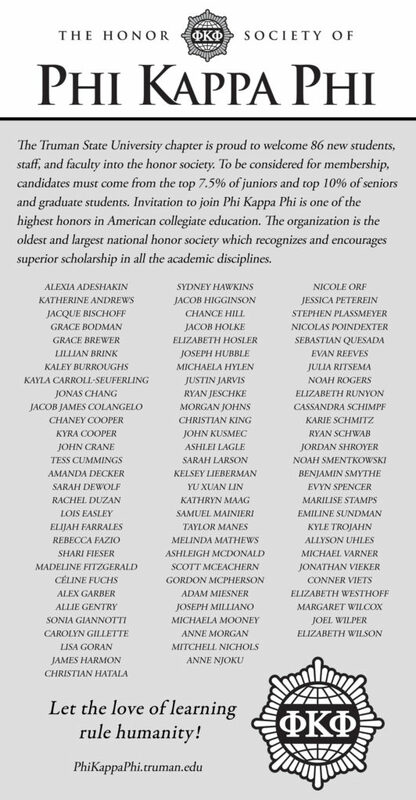 New members to the Honor Society include Alexia Adeshakin, Katherine Andrews, Jacque Bischoff, Grace Bodman, Grace Brewer, Lillian Brink, Kaley Burroughs, Kayla Carroll-Seuferling, Jonas Chang, Jacob James Colangelo, Chaney Cooper, Kyra Cooper, John Crane, Tess Cummings, Amanda Decker, Sarah DeWolf, Rachel Duzan, Lois Easley, Elijah Farrales, Rebecca Fazio, Shari Fieser, Madeline Fitzgerald, Céline Fuchs, Alex Garber, Allie Gentry, Sonia Giannotti, Carolyn Gillette, Lisa Goran, James Harmon, Christian Hatala, Sydney Hawkins, Jacob Higginson, Chance Hill, Jacob Holke, Elizabeth Hosler, Joseph Hubble, Michaela Hylen, Justin Jarvis, Ryan Jeschke, Morgan Johns, Christian King, John Kusmec, Ashlei Lagle, Sarah Larson, Kelsey Lieberman, Yu Xuan Lin, Kathryn Maag, Samuel Mainieri, Taylor Manes, Melinda Mathews, Ashleigh McDonald, Scott McEachern, Gordon McPherson, Adam Miesner, Joseph Milliano, Michaela Mooney, Anne Morgan, Mitchell Nichols, Anne Njoku, Nicole Orf, Jessica Peterein, Stephen Plassmeyer, Nicolas Poindexter, Sebastian Quesada, Evan Reeves, Julia Ritsema, Noah Rogers, Elizabeth Runyon, Cassandra Schimpf, Karie Schmitz, Ryan Schwab, Jordan Shroyer, Noah Smentkowski, Benjamin Smythe, Evyn Spencer, Marilise Stamps, Emiline Sundman, Kyle Trojahn, Allyson Uhles, Michael Varner, Jonathan Vieker, Conner Viets, Elizabeth Westhoff, Margaret Wilcox, Joel Wilper, and Elizabeth Wilson. Dr. Janet Gooch, Truman’s Provost and a member of Phi Kappa Phi, delivered the keynote address. The check-in table featured the original, hand drawn charter document from 1991. The cover of this year’s program. 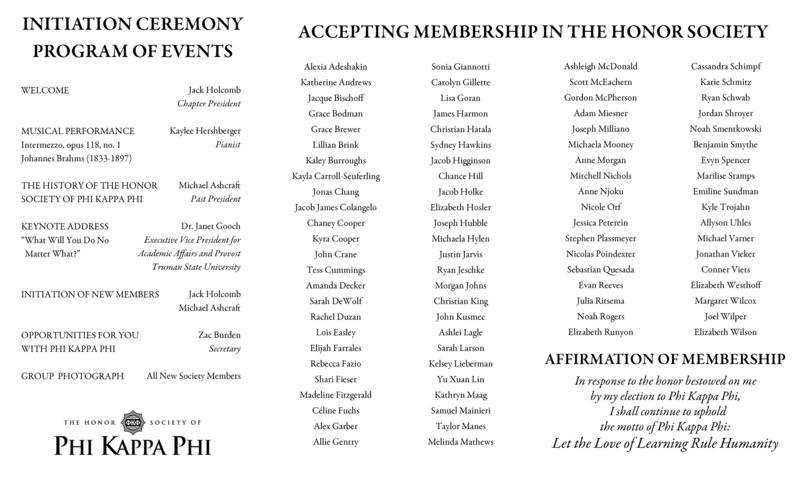 The inside of this year’s program features the names of all the new members. This ad will run in an upcoming issue of Truman’s school paper, The Index. Get excited! 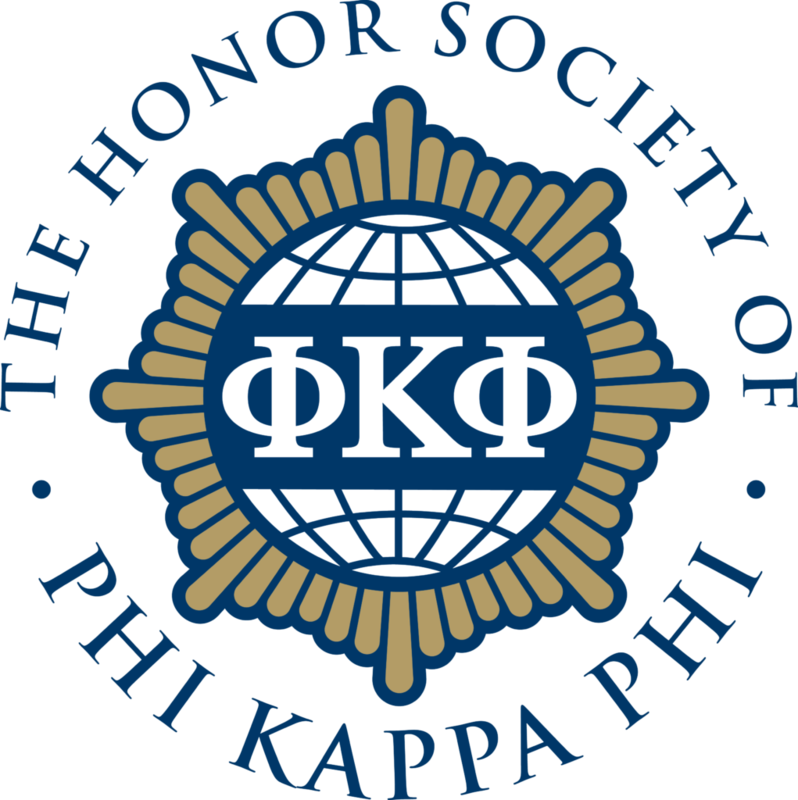 On Sunday, we are inducting 86 new members of Phi Kappa Phi. It’s our largest class since 2009! 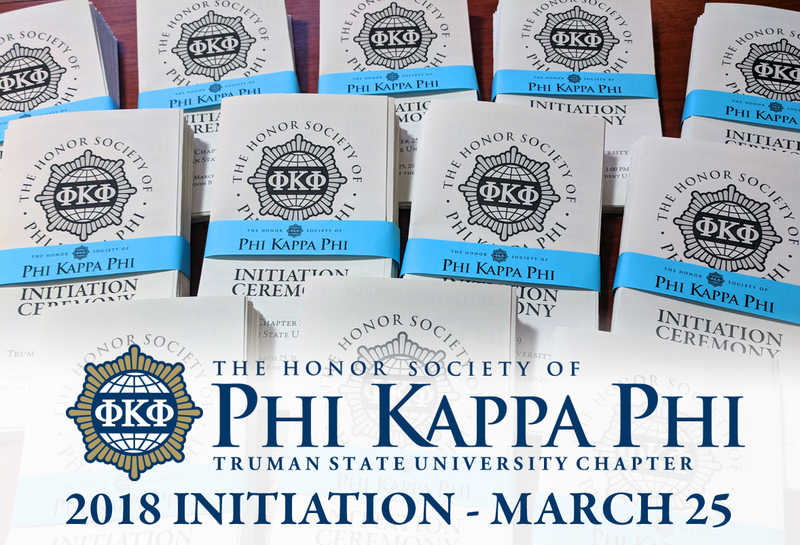 All members of the Honor Society are invited to attend the ceremony at 1:00 PM on Sunday, March 25, in Georgian Room B in the Student Union. 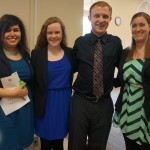 To conclude the Student Research Conference today at Truman, Phi Kappa Phi held an afternoon reception. Chapter members were recognized for their efforts either as student researchers or as faculty research mentors. Three new faculty/staff members were inducted, including Janet Blohm-Pultz of the McNair Program, Meg Edwards of the Political Science department, and Kathy Otero of the Accounting department. Truman alumna Bridget Morton was also inducted. Bridget is a 1982 graduate of the university and is, among other things, an active adviser to Truman’s Delta Zeta sorority chapter. 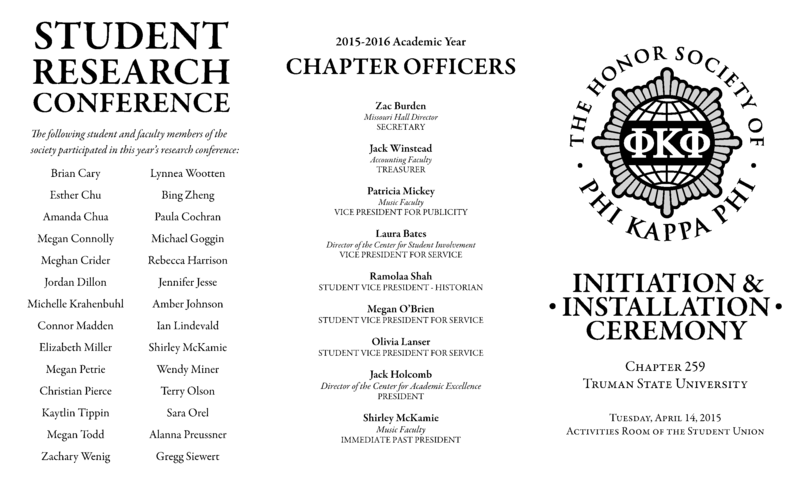 Officers for the 2015-2016 academic year were installed as well. New officers include student vice presidents for service Megan O’Brien and Olivia Lanser, student vice president for history Ramolla Shah, treasurer Jack Winstead, and president Jack Holcomb. Since 1998, the Phi Kappa Phi chapter at Truman has supported literacy efforts through regular donations to the Adair County Public Library. Megan O’Brien, Student Vice President for Service, recently presented library director Glenda Hunt with a check for $300 to help support media acquisitions and library operations. 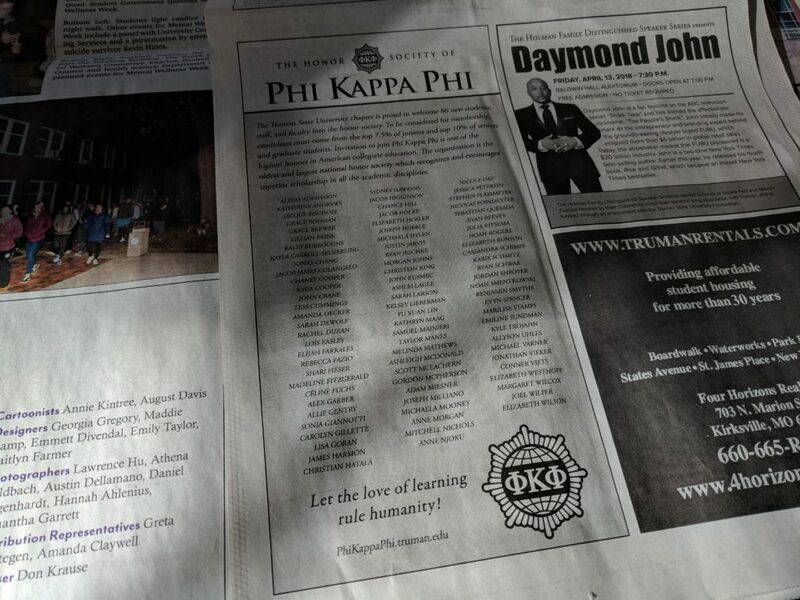 Nationally, Phi Kappa Phi endeavors to promote literacy through a wide variety of member projects. 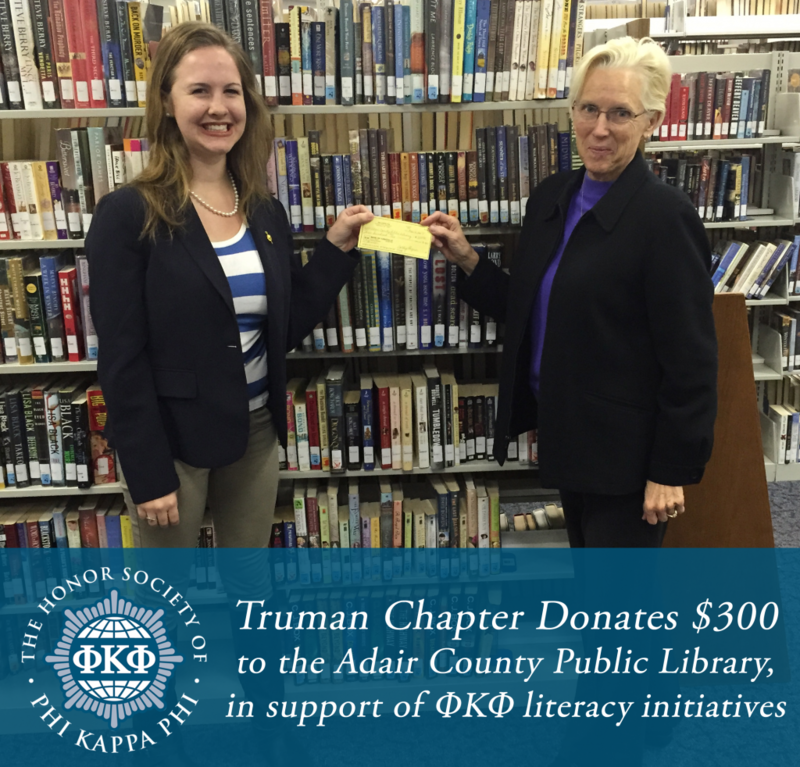 Members can even apply for ΦΚΦ literacy grants to sponsor projects in their communities. Learn more online at http://bit.ly/1DFtTLT. 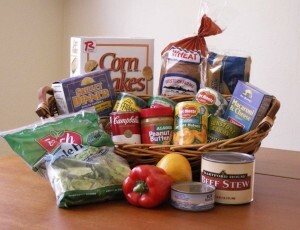 Please donate staple food items this week to help with the Novinger Christmas Basket project! You can bring your donation to the SUB Office, located just off The Hub on the main floor of the Student Union. 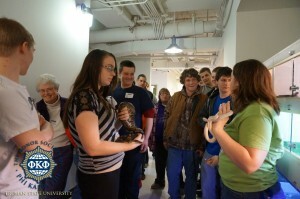 Phi Kappa Phi partners with Novinger each year to help engage their students in the idea of post-secondary education. Novinger is a town of 450 people just west of Kirksville. The K-12 Adair County R-I School serves Novinger and the surrounding community. 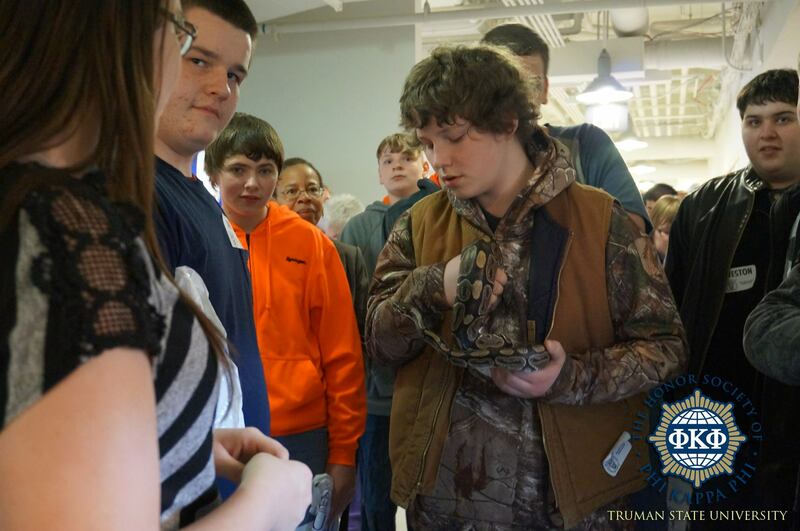 The school has 250 students and faces a number of financial concerns common to small, rural districts in Missouri. 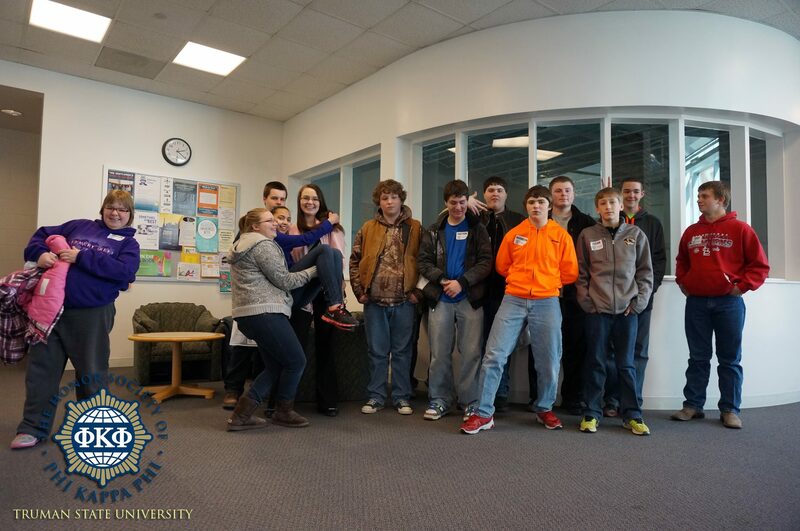 Phi Kappa Phi works with the eighth grade class to help them envision a personal future in higher education. Showing goodwill with the Christmas Basket Project is a great way to start that effort with a new class each year. The baskets go to help feed needy families in the area. Be sure to swing by the SUB Office this week with your “staple food item” donation. Thank you! In October, chapter president Shirley McKamie was notified by the national office for Phi Kappa Phi that Truman was selected as a Chapter of Excellence for efforts in the 2013-2014 academic year. Chapters are evaluated on their efforts to promote membership, foster a love of learning in their community, and develop new strategies within the organization. This year’s selection is possible for many reasons, including continued work to get children excited for higher education and the selection of a former member for a Phi Kappa Phi fellowship. 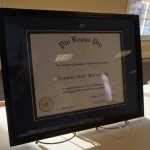 The national office recently had a piece run in the Truman Today highlighting this achievement. 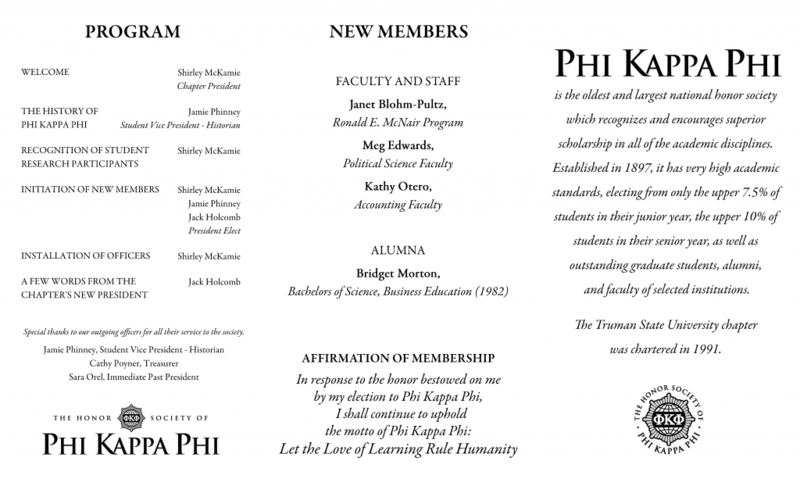 The Truman name will also be featured on the national Phi Kappa Phi site this year. In addition to the recognition, the chapter was awarded a prize of $500 from the national office. 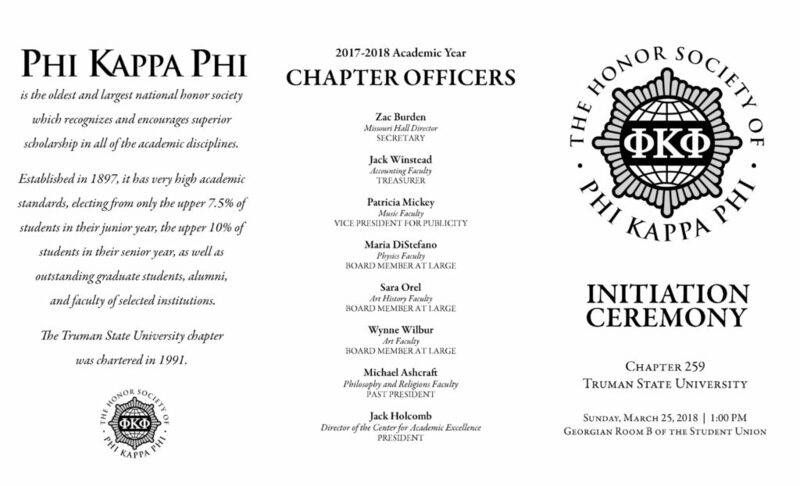 The chapter looks forward to its continued efforts this year, hopefully resulting in additional recognition by the national office. 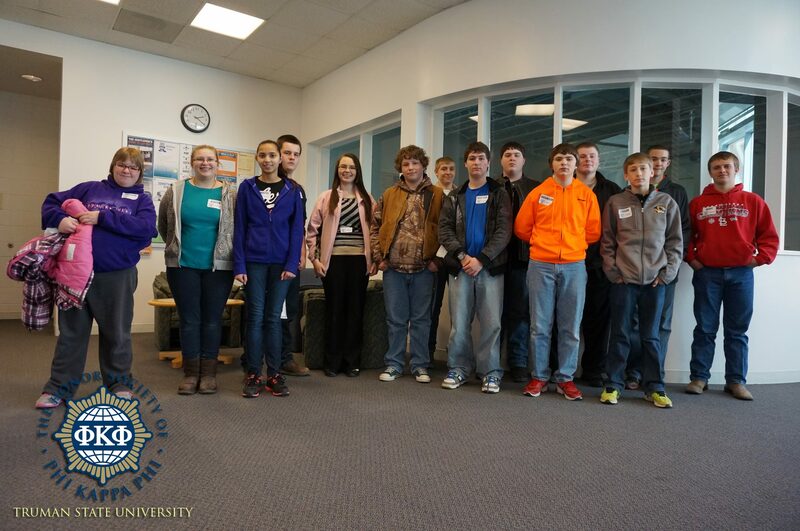 On Sunday, November 16, 2014, 33 students became the newest members of our chapter. The event began with a reception and refreshments at 2:30. 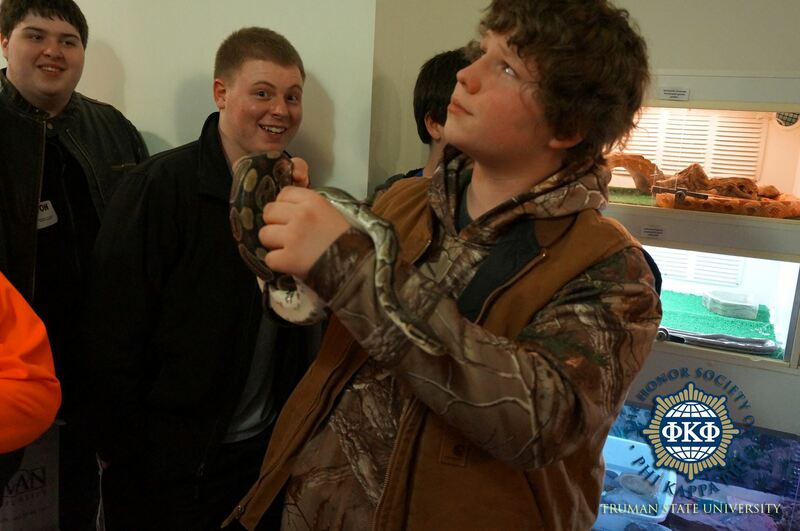 The event featured music by Taylor Jokerst, a Society member. The keynote speaker was Dr. Susan Thomas, Truman’s Executive Vice President for Academic Affairs and Provost. Dr. Thomas titled her keynote “Be a Bulldog and a Cat!” She encouraged all the high achieving students to take risks and climb to high places, even if there is a chance they might fall. The trick is always landing on your feet and having the courage to climb again. This year’s inductees include: Ian Ramon Abundis, Eric Balsman, Derek Benjamin, Amanda Chua, Zane DeZeeuw, Breanne Durovic, Laurie R. Hall, Lester Dominick Hubble, Clara Elizabeth Hughes, Brian Steven Jacob, Julia Judlin, Shelby Kane, Olivia Catherine Lanser, Kira Chatham, Connor Madden, Charlotte Merrigan, Megan O’Brien, Christian Alexander Scott Pierce, Anna Selle, Ramolaa Shah, Amanda E. Shreves, Ryan Staines, Rosalie Swingle, Kaytlin Tippin, Megan A. Todd, Rosemary Truman, Danielle Marie Vassallo, Charles R. Walde, Zachary Wenig, Ian Wohlstadter, Ashton Nicole Wolter, Lynnea D. Wootten, Bing Zheng. 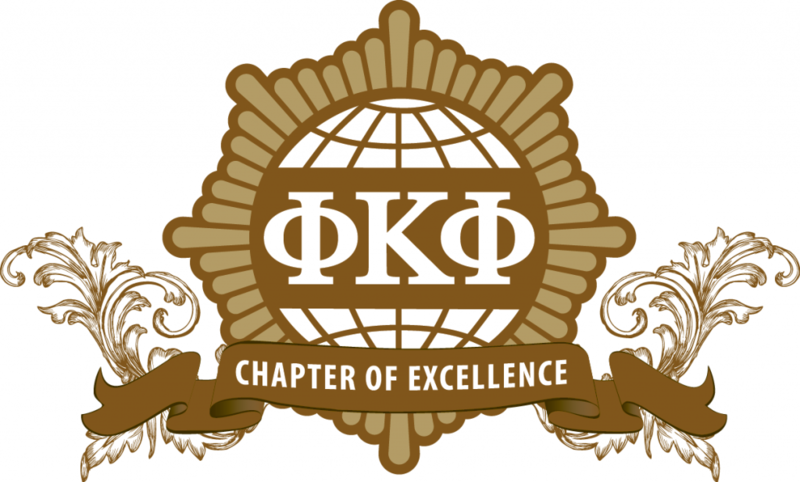 Our chapter has been recognized this year as a Chapter of Excellence by the National Phi Kappa Phi office. Members were awarded their membership certificate and pins. A small group of initiates after the ceremony. 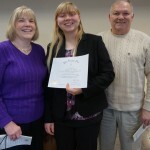 Megan Todd and her family celebrate her initiation. 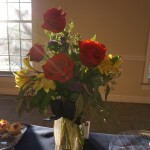 Flowers at the refreshments table were presented to Dr. Thomas to thank her for speaking at the ceremony. 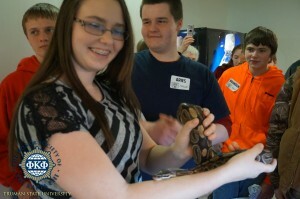 The chapter continued its work this past spring with students in a local school district. The idea has been to help get middle school students on a college campus so they can begin to picture themselves being on one as college students in the future. 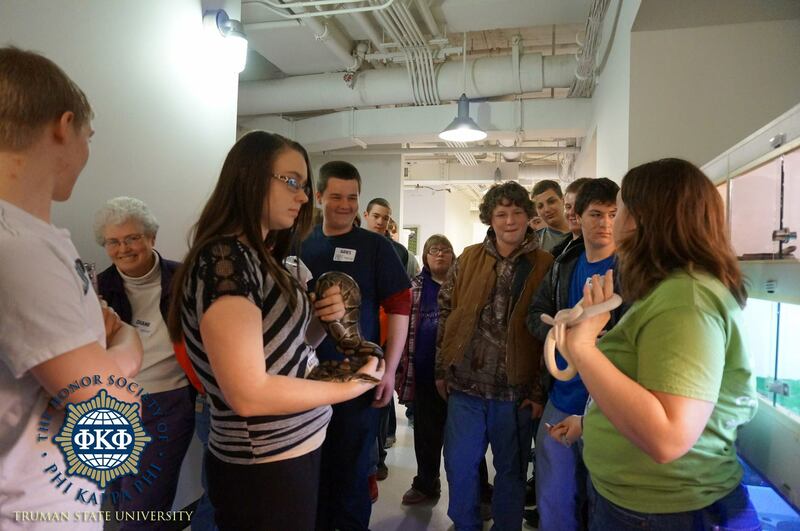 This past year, under the leadership Vice President Diane Johnson, the chapter showed students a variety of campus activities and venues. The students began with lunch in Missouri Hall, something that immediately received high praise as they enjoyed the all-you-can eat setup. Students got to see Cantoria practice. The group moved over to the Severns Theater where Professor Ron Rybkowski gave a demonstration on lighting. He showcased how science and art collide in costuming and lighting work. The students listened to a wind symphony rehearsal. After that, it was off to the herpetology lab where students got to handle many of the snakes, reptiles, and amphibians. They ended with a tour of the Student Recreation Center led by Director Sue Limestall. Sue is also a member of our chapter. The project will continue this year under the leadership of Laura Bates, the chapter’s new Faculty/Staff Vice President for Service. This a great service opportunity for chapter members who enjoy service and/or are looking to go into education of any kind. If you’re looking to get involved, be sure to email Laura at lbates@truman.edu.